Good morning, everyone! Hope you've had a wonderful weekend so far! I'm very happy to announce that today kicks of The New Black Week here at Princess Polish! 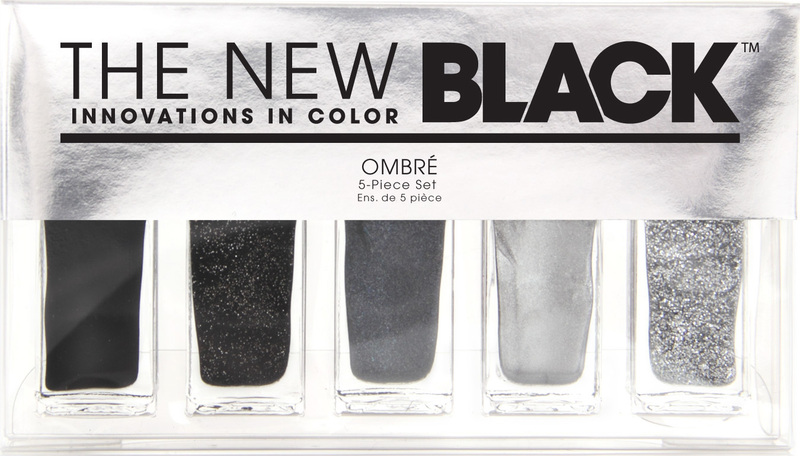 The New Black is a relatively new presence in the world of nail polish, but I am being entirely honest when I say that their products are incredibly unique. Instead of offering singular polishes, they created specially-themed sets that are highly affordable, yet offer the ability to re-create hot nail trends at home. 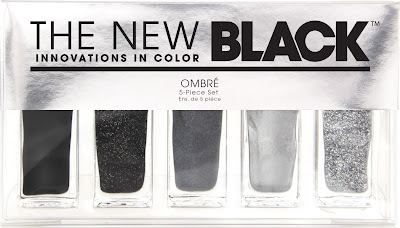 So this week, I'm going to be showcasing a different set of nail polishes from The New Black every day, culminating in an awesome giveaway on Saturday. Excited? Me too! First up is a set that caught my eye right from the start. It's one of the five piece sets from TNB and is an ombré collection. As you can see, this is definitely an ombré effect at your fingertips. It goes from a black creme all the way to a silver glitter. At first glance, I wasn't sure how this would look on me. 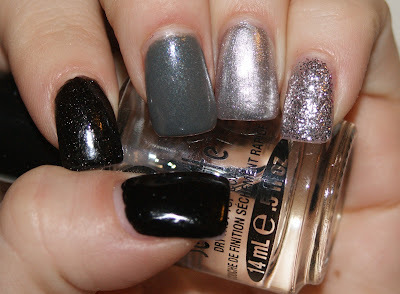 The idea of mixing cremes, glitters, and metallics to make the ombré nail effect was a little perplexing. But then I figured... what the heck and tried this one out first. Everything dried relatively quickly and I had ombré nails in under 15 minutes. With the polish-mixing technique that is what most of us rely on, it takes me that amount of time to mix two shades. With the Graffiti set, I had five manageable bottles to work with that created an outstanding effect that was not only show-stopping (in one class alone, I had to pass on the polish info at least twenty-five times), but drop dead gorgeous. I honestly felt like a rock star. All of The New Black sets are available at Sephora, Nordstrom, and Beauty.com. The ombré sets, like Graffiti, include five 0.125 fl oz. bottles of polish. All polishes by TNB are 3-free, cruelty-free, and vegan friendly! So what do you think of the Graffiti set? Are you excited as I am for The New Black Week? Looks Great on you! I Love that the black is a one coater! Amazing!!! Definitely a good thing that the ombre effect can be achieved without much hassle.